With some digging, I found the old smaller IR filters I have had for many years, ones I used about 10 years ago with a CoolPix digital P&S, and amazingly enough they were the perfect 49mm thread size for the X100 - what luck! 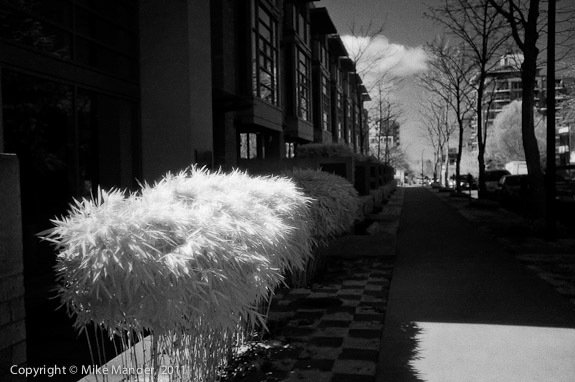 So can one shoot IR with a non-modifed standard X100? Yes... but with some limitations. 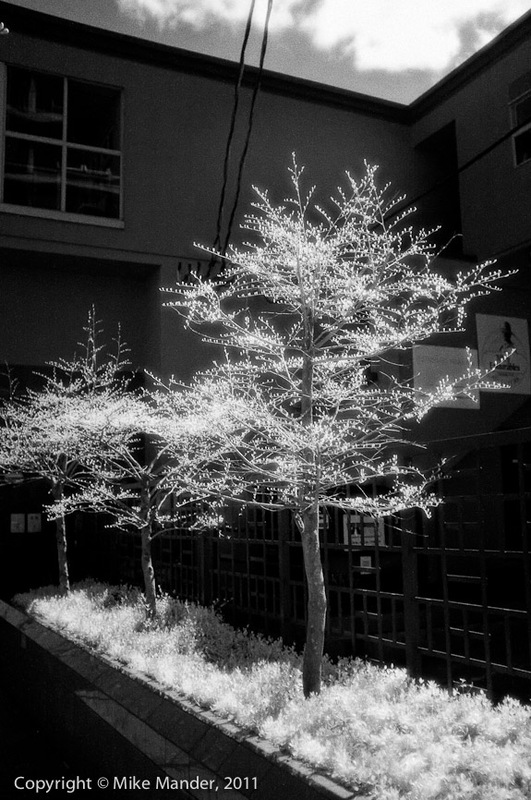 The IR blocking filter that is installed in the X100 seems quite strong, so when one adds a visible light blocking filter like a Hoya R72, the shutter speeds become very long or one requires very high ISO. 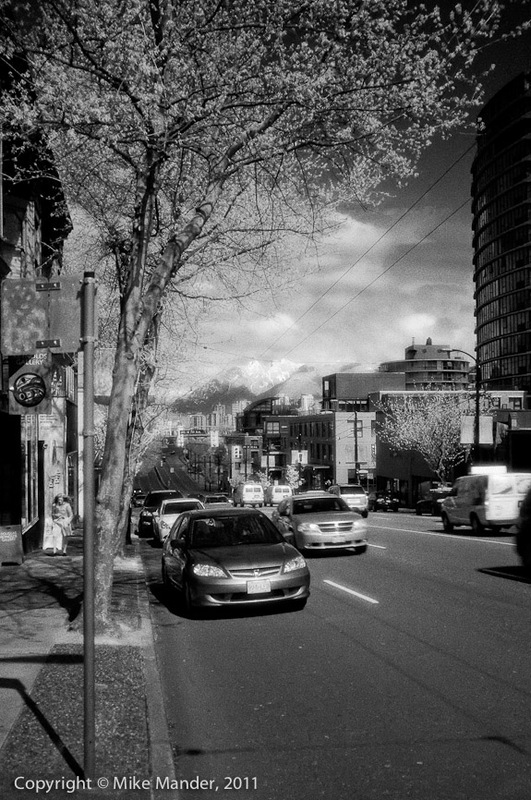 The images in this posting were all shot handheld, with an X100 at ISO 6400, shooting through a Hoya R72 filter. I was at either f/2 or f/2.8 and shutter speeds were between 1/10 and 1/40 second. 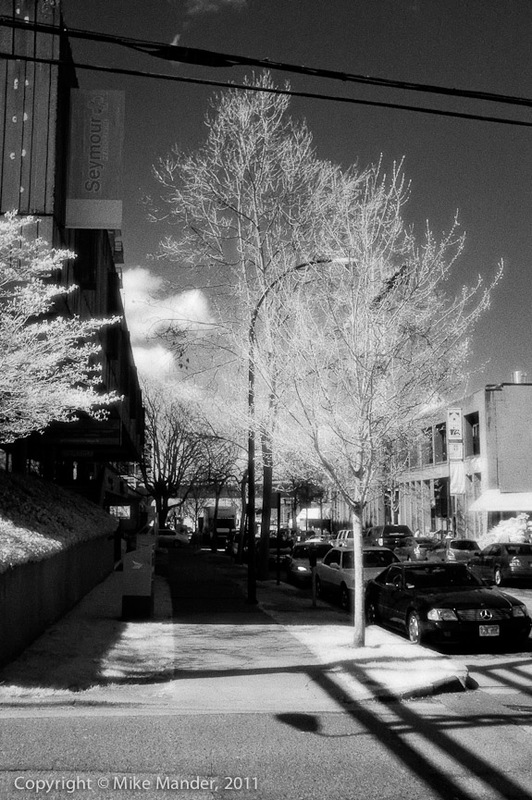 I post-processed the images using a modified version of the "IR Action" I made in Photoshop for working with my IR converted EOS-20D images. Note that although somewhat grainy, the regular ISO 6400 shots from the X100 are nowhere near as "bad" as these images. My action does add a fair bit of grain. 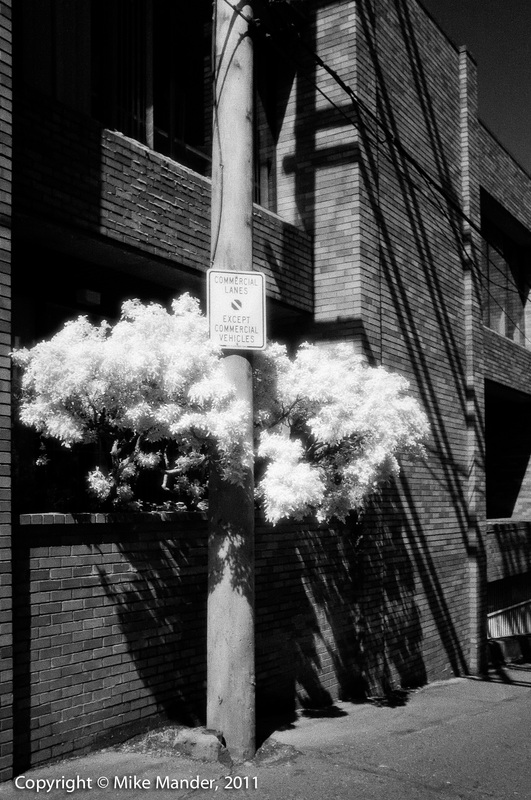 I really liked the look of the old Kodak HIE high-speed infrared film, with its halation glow and graininess, which is why I made an action that tried to simulate that look from the overly smooth digital IR files I was getting with my modded 20D. It doesn't quite achieve the exact look of course, but it's not all that bad I think. The contrast of a raw X100 filtered IR image is certainly much less than from an IR-converted camera, but it is still workable. I will have to do some more testing since I was surprised at how light the sky rendered in these photos. Hopefully it was just too hazy a day for the X100 to produce the characteristic dark skies that one would normally get with IR. 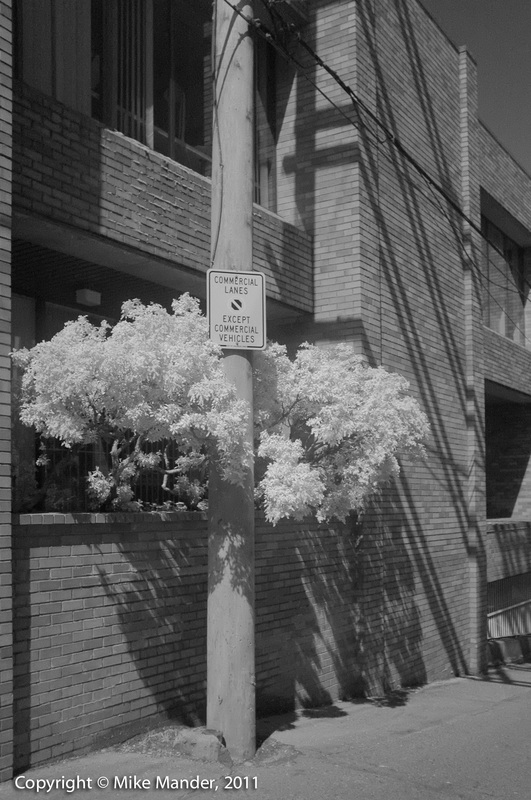 I will have to try with an even darker 093 filter to see if that makes for more dramatic IR contrast, although I suspect shutter speeds will drop so much, that I won't be able to handhold anything anymore. 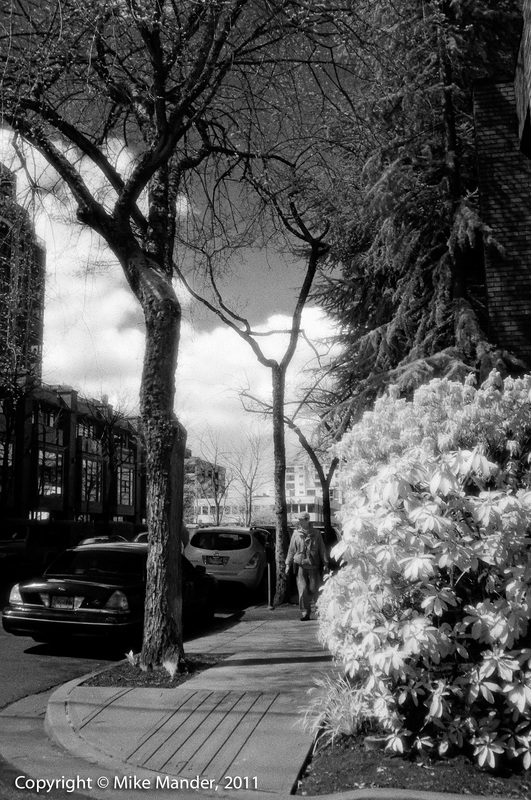 Finally, the X100 seems to reliably autofocus through the R72 filter and composing a shot is quite doable (in bright sunlight) with the EVF. Unfortunately the X100 dims down the OVF framing lines so much with the near opaque filter attached, it is unfortunately not possible to use that way. 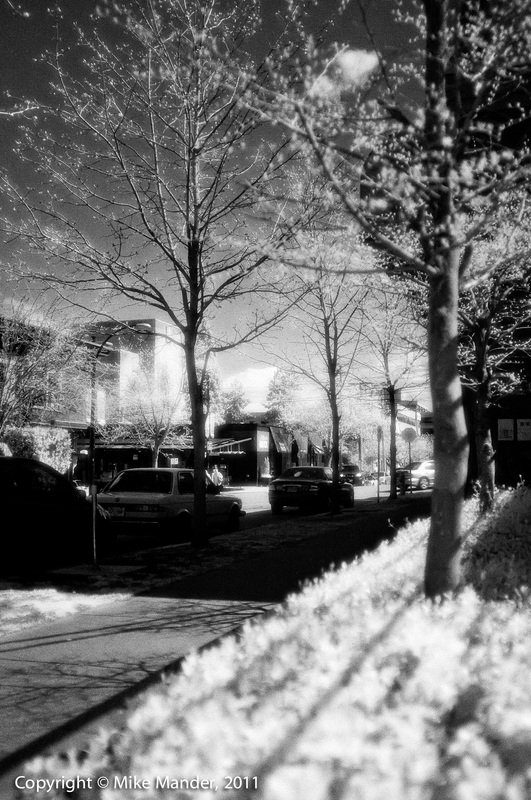 Its metering seems quite accurate as far as getting a good IR exposure and the Fujinon lens seems very resistant to IR flare and hot-spots, a testament to its excellent lens coatings. Absolutely great post Mike! I think I sent Fuji a very similar email to this effect, but I didn't get a reply. I think Fuji would be concerned that the market for such a product would be to small. However, like you say, there wouldn't need to be a huge modification to the current model to make this. I would buy it without hesitation, although I would buy a purely IR X100 anyway, actually my choice would be a 720nm filter by default and a 950nm filter on the selectable ND switch :). Anyway, great shots here! I love the processing, can you explain in a bit more detail how you get the halation glow effect please? Simon: Sorry, I guess I never noticed your comment from nearly two years ago! No feedback from Fujifilm but the rep did pass along my comment to head office. Here in Canada, Fujifilm was weird about selling their other IR-enabled cameras, the IS-1 and S3 Pro UV/IR. As a regular consumer or even pro photographer, you couldn't actually purchase those models, only law enforcement agencies or universities could actually buy them. I think there was a way, maybe by signing a waiver or something, but they didn't make it easy. Edd: Thanks for the comments. The glow is easy to do in Photoshop. Basically use "select colour range" to select the highlights, copy the selected area to a new layer, do a gaussian blur on that layer, adjust the levels of the highlights layer to brighten it a bit, then play with blending modes and opacity to get the desired effect. Thanks for the info Mike! Sorry I didn't get back to you sooner, I assumed Gmail would send me a note when you replied as it does when people send stuff to my blog, anyway, that's a great tip, I will try it out soon :). Also interesting to hear about how Fuji sold their UV/IR cameras there, I don't think it was like that here, but I'm not sure. Just got a Fujifilm x100T. Was there any modifications to the sensor to get these shots?